Although some scallops are renowned for their ability to swim, many such as the Scaly Scallop remain sessile for all their lives, anchored by byssal threads to rocks, coral rubble or even large dead shells. The Scaly Scallop, as its common name implies, is sculptured with numerous, short vertical scales. These further assist the animal to maintain its connection with the sea floor, but also encourage the growth of other organisms such as tube worms and sponges thereby helping to provide camouflage from predators. The species grows to 60-70mm and is fished commercially in southern Australian states, particularly Tasmania. 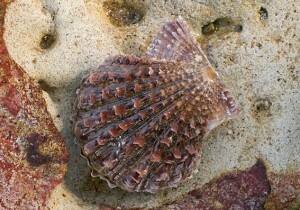 Shells of the Scaly Scallop vary widely in colour from white through to yellow, red and (most commonly) brown. Indo-Pacific: Widespread along the Australian coast.